This page is designed to give you ideas and sources on how to make your own costumes. Let your creativity run wild when you design your one of a kind costumes. New items will be added when I run across them. Have fun and start sewing. Cairo's Costume Disasters - by Leyla Lanty. Tacky, bizarre and surprising costumes worn by Cairo's stars of oriental dance. Plenty of photos. Article from the Gilded Serphant. Costuming Info - from Flying Skirt website. by Dina has several books in the making and book one is available now. This booklet will be spiral-bound with black plastic to lie flat for use while sewing, and contain about 70 pages with 20+thousand words, 95 illustrations, 20 black and white photos, and blank figures for sketching designs. This booklet will be spiral-bound with black plastic to lie flat for use while sewing; about 40 pages, numerous illustrations, black and white photos, a measurement chart, and blank figures for sketching designs. This booklet will be spiral-bound with black plastic to lie flat for use while sewing, and contain about 40 pages, with numerous illustrations, black and white photos, and blank figures for sketching designs. This booklet is 60 pages, including a 24 page Photo Gallery featuring 7 designers. Costuming from the Hip is a comprehensive reference for anyone who works with Middle Eastern dancewear. Dancers, costume makers, designers, and historical re-enactors will like the many illustrations, historical patterns, construction techniques, and hundreds of hints and tips. This 120-page book will take you step-by-step through measuring your body, researching your costume, laying out the patterns, fitting it, and accessorizing your creation. From Turban to Toe Ring is a guide for designing and making tribal-fusion belly dance wear. This style, which originated in the San Francisco dance community and has spread world-wide, is fast becoming one of the most popular costuming options. Tribal-fusion costuming is an assemblage of design elements pulled from many different tribal, rural, and nomadic peoples from North Africa, across the Near and Middle East, and as far away as India. Surface design techniques, articles of clothing, and jewelry components are fused together to create a look that blends all of these items into an exciting and uniquely individual image for each dancer. Hanezebs Costuming hints & help - this section of Hanezeb's site is dedicated to help beginners and advanced dancers in costuming. Costumer's Notes - This monthly eNewsletter features articles, links, reading lists, product reviews and more. Edited by Dawn "Davina" Devine Brown, publisher of "From Turban to Toe Ring" and "Costuming from the Hip". Custom Headgear - FAQ's from Middle Eastern Dance Resource Guide. Customs of Middle Eastern Makeup and Decoration - FAQ's from Middle Eastern Dance Resource Guide. Henna Tattooing (Mehndi) - FAQ's from Middle Eastern Dance Resource Guide. Navel Jewels - FAQ's from Middle Eastern Dance Resource Guide. In this section are websites that contain directions and patterns on making Belly Dance costumes and websites that sell Belly Dance patterns. Have fun creating your own costumes. Costume Tips: harem & cabaret skirt - pattern and instructions on making harem pants and a circular skirt. Costume Tips: Rafiqa's accent overskirt - pattern and instructions on making four point accent skirt from the Sheikhani Dance Troupe of Colorado Springs. Simple Caftan - instructions & pattern on how to make a caftan. B.D. Patterns - patterns for skirts, tops, pants, dresses, coats and more. Belly Dance Costume Pattern: where to get them - info from Shira's page. 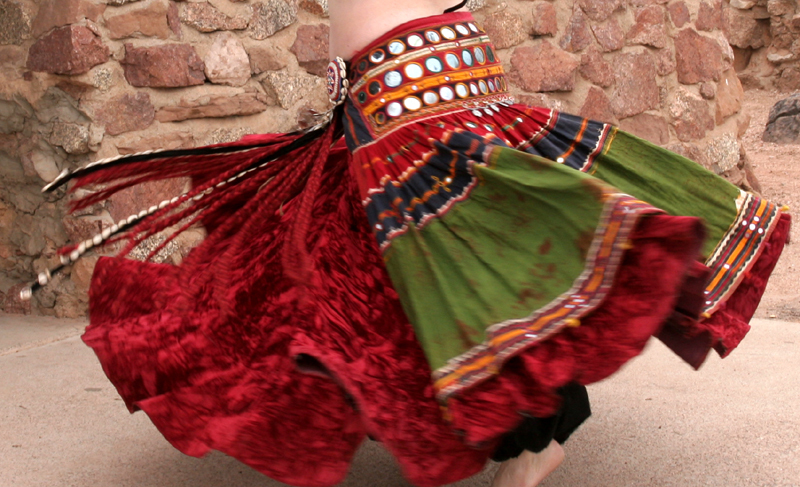 Costume Tips: full circle cape - costume Tips from the Sheikhani Dance Troupe of Colorado Springs. Instructions on how to make a circle cape veil. Making a Semicircular Veil - instructions from Shira's website. 200 N. MacDonald, Mesa, AZ. Enjoy a day of shopping, workshops, networking with other dancers, having fun plus an evening show. Registration for workshops are now open. Would you like to see your ad here?? Check out the Ad Page for more info.